The HNC in Landscape Management (SCQF level 7) develops knowledge and skills in areas such as constructing hard landscape features, the design process and composition, fundamentals of landscape surveying, plant recognition, and planting design for parks, gardens and public spaces. This qualification will give learners the knowledge, understanding and practical skills required to work in the landscape management sector. This HNC is available through colleges, training providers and some universities. Typically, an HNC takes one year to complete and an HND takes two years. 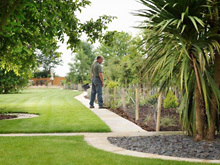 Learners who achieve an HNC Landscape Management can progress to the HND in Landscape Management, HND in Garden Design or HND Horticulture. HNDs can provide progression to degree-level study. For example, the HND in Landscape Management allows direct entry to some third year programmes. The HNC will provide the knowledge and understanding and practical skills needed to work at a junior level in the sector. Higher National qualifications also provide the knowledge and understanding required for related Scottish Vocational Qualifications (SVQs). For example, SVQ Level 3 in Landscaping. Assessment support packs are available for this qualification from SQA's secure website. HNC Landscape Management at SCQF level 7 consists of 6 mandatory Units (48 SCQF credit points) and a number of optional Units (48 SCQF credit points). For further information on the Units and Structure of this qualification please refer to the Group Award Specification.